It’s one of the newest light displays in Asheville and it’s also one of the brightest. Winter Lights at the North Carolina Arboretum features 500,000 energy-efficient LED lights throughout the nationally-known gardens. A special highlight on this walking-tour is the 50-foot animated tree that comes alive to music. Kids will delight at the Rocky Cove Railroad garden-scale model train. 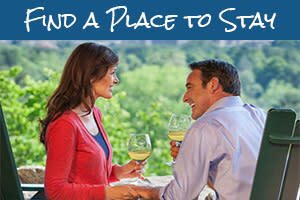 While visitors take in the sights, they can enjoy hot cocoa and snacks along their tour. Winter Lights runs November 16-December 31, 2018. From the designers of the Arboretum lights come new displays in Asheville, helping to make the season extra bright in downtown. 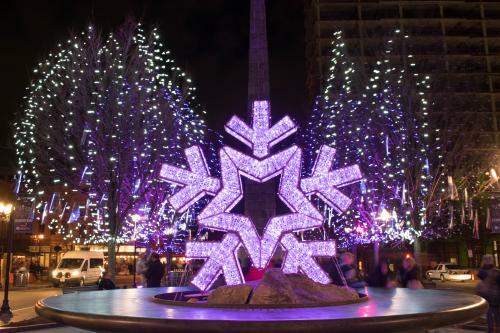 The light displays, Local Lights, will illuminate Pack Square and Pritchard Park in the heart of the city. 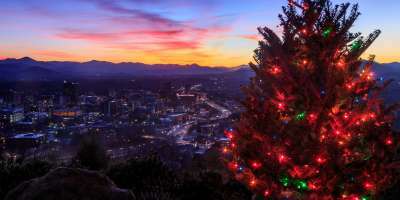 Following the Asheville Holiday Parade (Saturday, November 17, 11 a.m. to 2 p.m.), there will be a lighting ceremony in Pack Square Park that night at 6 p.m. The lights will make for a beautiful backdrop for photos while shopping and dining downtown. Speaking of shopping, head over to the historic Grove Arcade, which decks its halls with holiday decor inside and out for the Winter Wonderland celebration. Opening night festivities for Winter Wonderland are Friday, November 16, 2018 from 5-8 p.m. 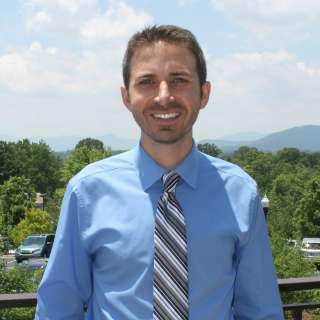 There will be a Deck the Halls Lighting Celebration with a performance by the Asheville Symphony Orchestra at 6 p.m. Santa will make appearances from 1-5 p.m. on December 2, 9 and 16. And, starting November 21, the Grove Arcade will host a Gingerbread House Display in partnership with the National Gingerbread House Competition at The Omni Grove Park Inn. From the moment visitors see the lighted Lodge Gate at the entrance to Biltmore, they know they are in for a treat. What awaits inside the gate is a classic Christmas that hearkens back to the days of the Vanderbilts. A giant 55-foot Norway spruce strung with 55,000 lights on the front lawn leads the way into the home where 60 more intricately-decorated trees highlight the Christmas at Biltmore celebration. The 30,000 lights and 150 candles inside the home are particularly magical at night during the Candlelight Christmas Evenings at Biltmore tour. Christmas at Biltmore begins with the annual tree raising ceremony on November 1, 2018. 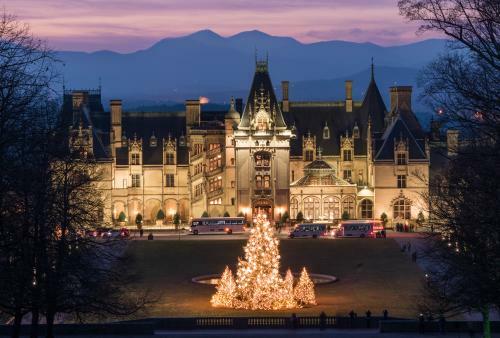 Christmas at Biltmore officially runs from November 3, 2018, through January 6, 2019. Just outside of Biltmore sits historic Biltmore Village with its stone streets, quaint boutiques, and inviting restaurants. The Village will have an enhanced lights display in 2018. 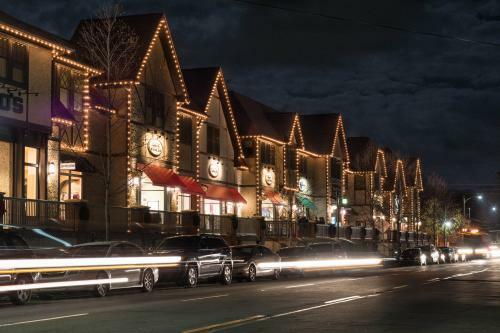 The new lights, set to come on in late November, will feature large 3-D angels and stars hanging across Biltmore Village Streets. For two days in early December, the Village transforms for the annual Dickens in the Village Festival. Shopkeepers dress in Victorian-era garb and the main stage fills with musicians, choral groups, singers and dancers. New in 2018, the festival will feature a puppet show and a free tasting event/hot drink contest, "Mugs of Merriment." Dickens in the Village is November 30-December 1, 2018. The tree lighting ceremony is November 30 at 6:0 p.m. There are few places that offer the coziness and warmth of the season like the Great Hall at The Omni Grove Park Inn. Lighted wreaths adorn giant fireplaces with welcoming rocking chairs just waiting to transport visitors to holiday relaxation. 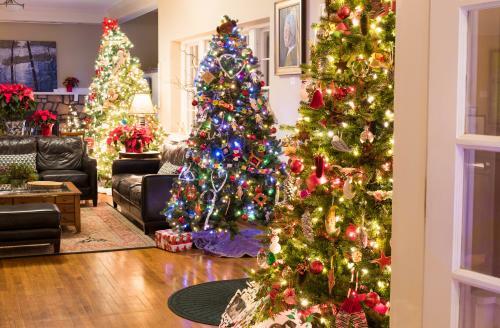 Dozens of decorated trees brighten the halls of the Inn. Grab a mug of ganache-based hot chocolate with house-made marshmallows as you enjoy viewing the more than 150 entries in the National Gingerbread House Competition, November 25, 2018 to January 4, 2019! 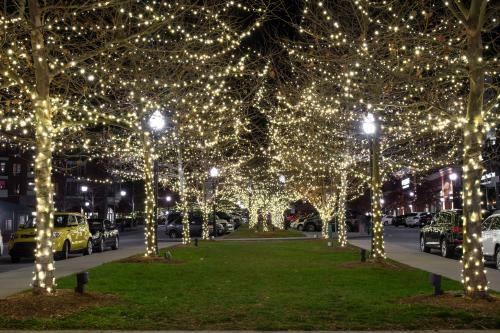 One of Asheville’s most beautiful shopping areas, Biltmore Park, glows at night with tens of thousands of lights. Beautiful lighted trees line the sidewalks in front of the many stores and restaurants. The celebration kicks off on December 1 from 2:30-6 p.m. with day of activities, including photos with Santa and a tree lighting ceremony. 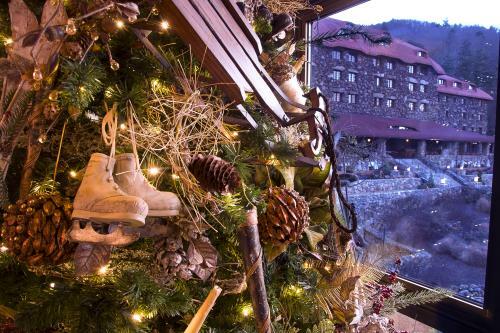 In nearby beautiful Black Mountain, The historic Monte Vista Hotel comes alive with twinkling lights and decorated Christmas trees. From the hotel&apos;s featured art collection to live music, from drink specials to the decorated trees, there&apos;s much to enjoy at this great event. This year&apos;s theme is "There are Angels Among Us." While it is free to see the trees, you can vote for your favorite by making donation by cash or check. 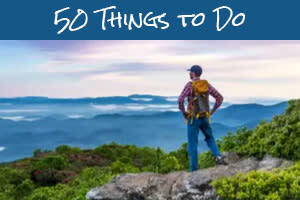 All funds raised will go to the Swannanoa Valley Christian Ministry. The trees will be on display, November 30, 2018 through January 6, 2019. 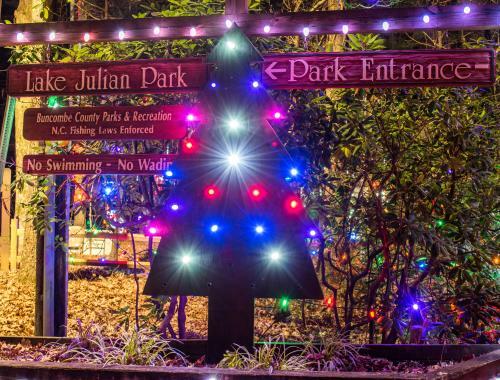 The hotel is open daily from 10 a.m. to 9 p.m.
A local drive-thru light show, Lake Julian Festival of Lights, illuminates a popular Buncombe County park. The road circling the park becomes a magical journey through tunnels of dazzling lights with 50 animated and stationary light displays. 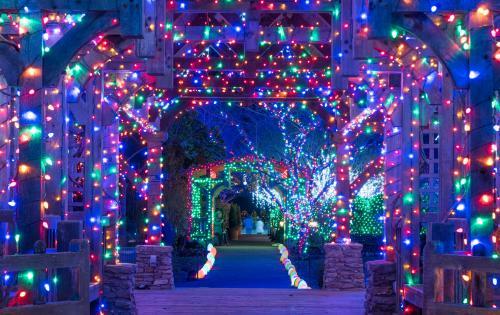 Visitors enjoying the lights will also be supporting a good cause – 20 percent of ticket sales are donated to Buncombe County Special Olympics. The season kicks off with the "walk through night," the only night you can walk through the park to see the lights. For the remainder of the season, you can drive through the park to see the lights. The lights are on December 2-23, 2018. Photo credits: Top photo by Jared Kay. Winter Lights at NC Arboretum, Winter Lights Downtown photos, Biltmore and Lake Julian photos by Jason Tarr. Omni Grove Park Inn photo by Charley Akers.